Event Productions, Inc. is a General Service Contractor for trade shows, expos, special and corporate events. The company’s goal is to incorporate its experience and commitment into every one of its projects to create more than satisfying results. We are a mid-sized General Service Contractor with a combined 100 years of trade show and event management experience. Our team consists of experts in trade show management, planning, branding, customer service and skilled labor. Based in the San Francisco Bay Area, we cover the entire United States - from San Diego to Chicago, Washington D.C. to Las Vegas. 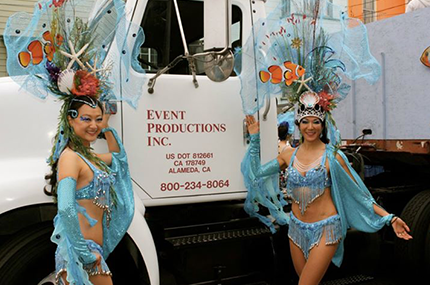 Event Productions competes to be the most reliable and creative General Service Contractor on the West Coast. We treat each event as a custom project regardless of size or budget. and are always looking to deliver high quality products and valuable services to our customers. We work in close partnership with clients to offer a service that sets new standards in producing events. We are a perfect fit for mid-size and small events because we can give the amount of attention to detail that larger General Service Contractors may not be able to provide because they are handling larger events the same week as yours. We also house more resources in our warehouse than other similar sized GSC's, making it easy to fulfill last minute orders. Event Productions believes extensive pre-show planning is crucial to having a successful event, we offer the knowledge and professionalism that comes from two generations of combined event experience. Venue visits, conference calls, and pre-show meetings are all a standard for Event Productions, as well as any other pre-show planning that show management deems necessary. Our staff is very hands-on and will be able to create and design floor plans that will best use exhibit space, making it both logistically and visually desirable for all of your attendees. We offer advanced features such as our Secure Online Ordering System that allows exhibitors to order items online to help them create an exhibit that they can be proud of. We also offer an Exhibitor Concierge to provide them with all the help they need to make their experience pleasant, so they will keep coming back to your event every year.